Heat the olive oil in a large skillet over medium heat for five minutes. Add the mushrooms and salt lightly. Cook, stirring once, for 2-3 minutes, until the color just starts to change. Add the garlic and stir well. Season the chicken on both sides with a sprinkle of salt and pepper. 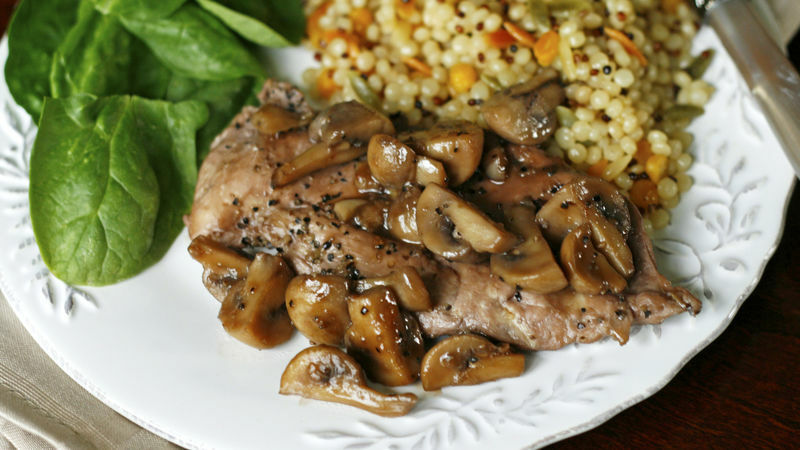 Push the mushrooms and garlic to one side of the skillet and add the chicken, laying it in a single layer. Cook, flipping once, for about 3 minutes per side (until just opaque). Add the chicken stock and wine. Cover and cook for 15 minutes. Remove the cover and flip the chicken. Let cook for 30 seconds before transferring the chicken to a serving plate. Sift a small amount of cornstarch (about 1 tsp) into the pan and cook the liquid, stirring constantly, until thickened. Spoon the sauce and the mushrooms over the chicken. There’s this thing that people who cook say about the wine you use in dishes: It should be something you would drink. For many years, I didn’t subscribe to the sentiment, stubbornly using the cooking wines from the vinegar aisle. But as my skills have improved, so has my desire to use good ingredients to create great dishes. Now, I can attest to the fact that a wine you’d happily drink makes a far superior savory dish. So, I’ve stopped buying cooking wines in favor of heading to the liquor store for good wine when I need to cook with it. So, my Pan Roasted Burgundy Chicken? It’s made with a fine pinot noir that has all sorts of yummy fruity notes (spoken like someone who still doesn’t fall into the wine connoisseur category, eh?). If you’re still using cooking wine, I beg you to stop. Give good wine a try. Yes, it can be more pricey (though not always, considering the size difference of the bottles), but it pays off big time in the flavor of your dishes. As for this dish, it’s an adaptation of one of my favorites. The original chicken recipe, which is something my mom made only once or twice, takes awhile to assemble and cook. But this one, using thin chicken breasts and a fast stove-top roasting method, is ready in just about 30 minutes. It has a rich, deep sauce flavored by but not overpowered by the wine. Serve this with a side dish like orzo or Israeli couscous, along with a simple salad. Do you cook with wine?